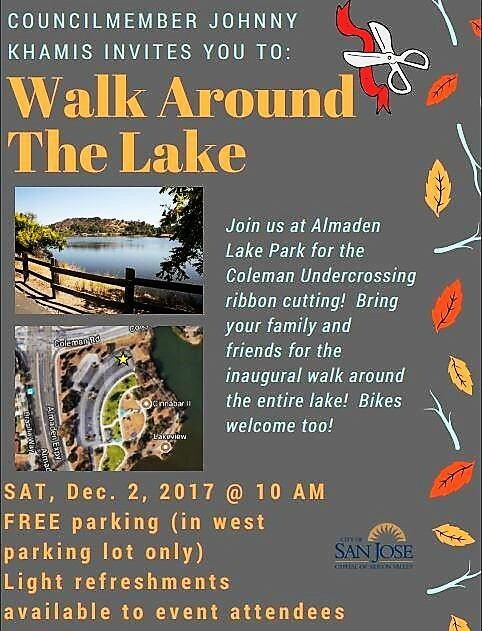 This is an article from the August 11th Almaden Times. “Citizen Scientist” Lee Pauser has been building, installing, and monitoring nest boxes (the proper term for bird-houses) for 16 years. He caters to 18 different species, ranging from Chickadees and Tree Swallows to Western Bluebirds, American Kestrels, Barn Owls and Wood Ducks. He also works with Silicon Valley Wildlife Center to release rehabilitated birds back into the wild. To read the rest of the story go to Tree Planting. 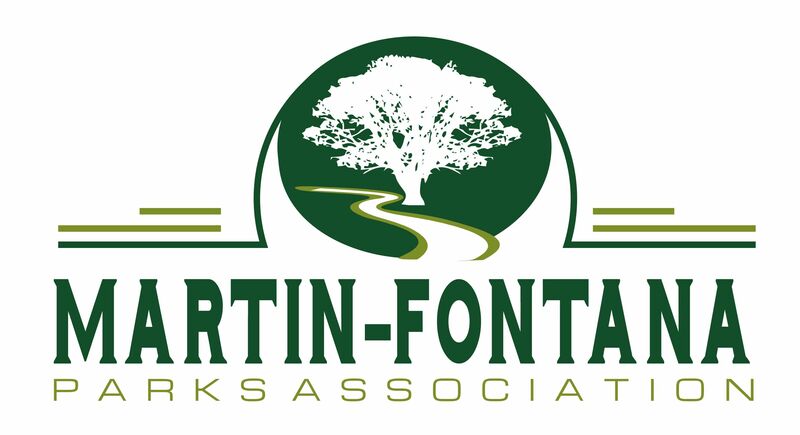 According to Martin-Fontana Parks Association Director, Richard Zahner, the City’s Parks, Recreation, & Neighborhood Services has committed to provide the water needed to establish the 55 trees. 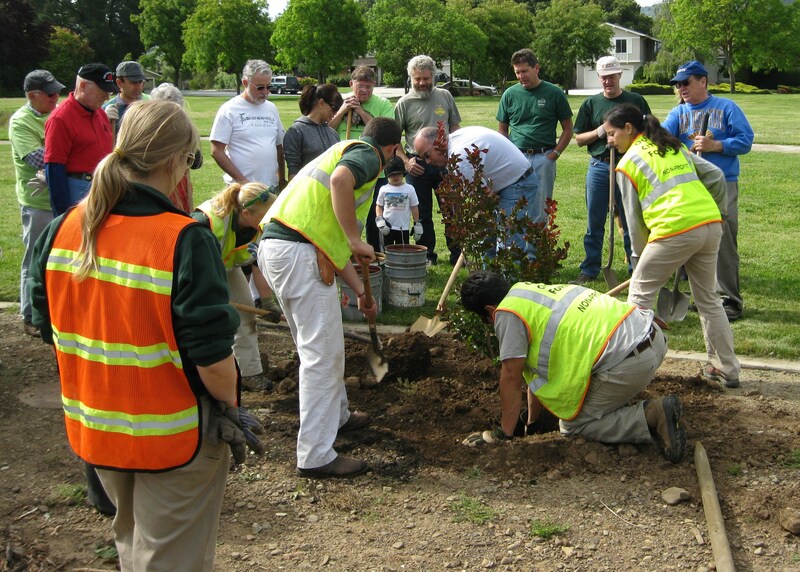 Our City Forest has committed to watering the trees and providing care such as trimming and shaping to assure their survival through the first three years. At that time the trees should be established and should require no more than the routine care provided by PRNS. In practice the first year will the most demanding, requiring 15 gallons per week. 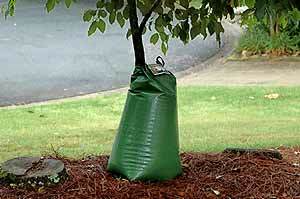 A ‘Tree Gator’, a type of plastic water bag, may be used to control and concentrate the water where it is most beneficial. Watering will be incrementally reduced over the second and third years to promote healthy roots and sustainable growth. Richard also serves as the Park Planning and Improvement Chairperson for MFPA. Early on the morning of Nov 13th. a new Parks Recreation and Neighborhood Services employee, Mark Conklin, met with Martin-Fontana Parks Association President, Rod Carpenter, members Dave Poeschel, Sunny Wagstaff, Rich Grialou and Project Coordinator, Patrick Pizzo. 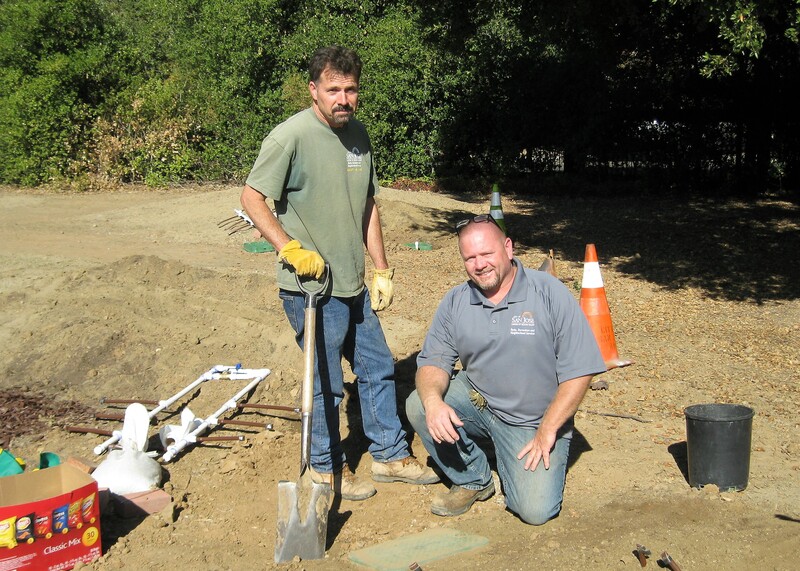 Mark was there to show us how to install the water manifolds that will be used to irrigate the five islands. These five islands are located in the West end of Jeffrey Fontana Park. Mark was there to show us on how to install the water manifolds for each of the five islands. These will provide the connections for the drip lines. Note: For more info on the project see Five Island Project Becomes a Reality in Jeffrey Fontana Park. Each of the five islands now have irrigation systems. The next step is to have our ‘sponsors’ commit to a planting date. For that day, we will ask for volunteers to come help our sponsors plant their plants and lay-out the drip-line, emitter-tubing. 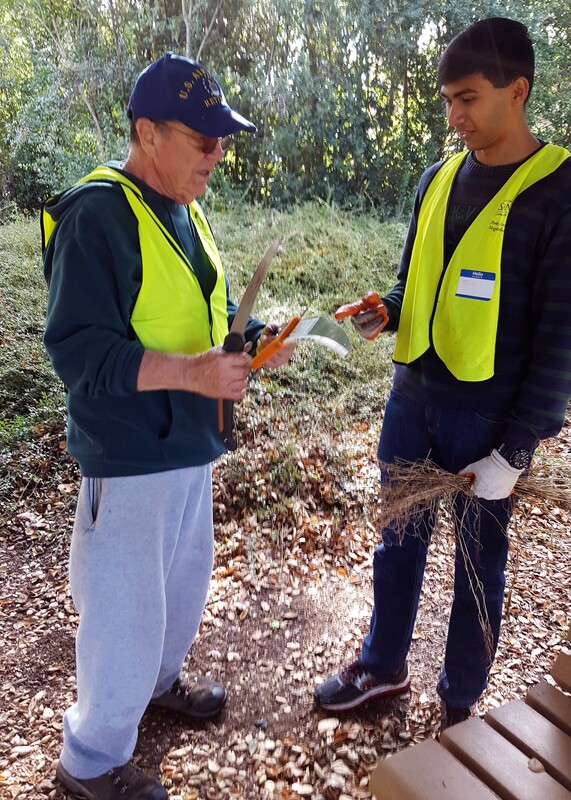 We’ll have to spend a little time too, spreading the wood bark on the islands after planting… to keep weeds down, lower surface temperature and to hold moisture in the soil. 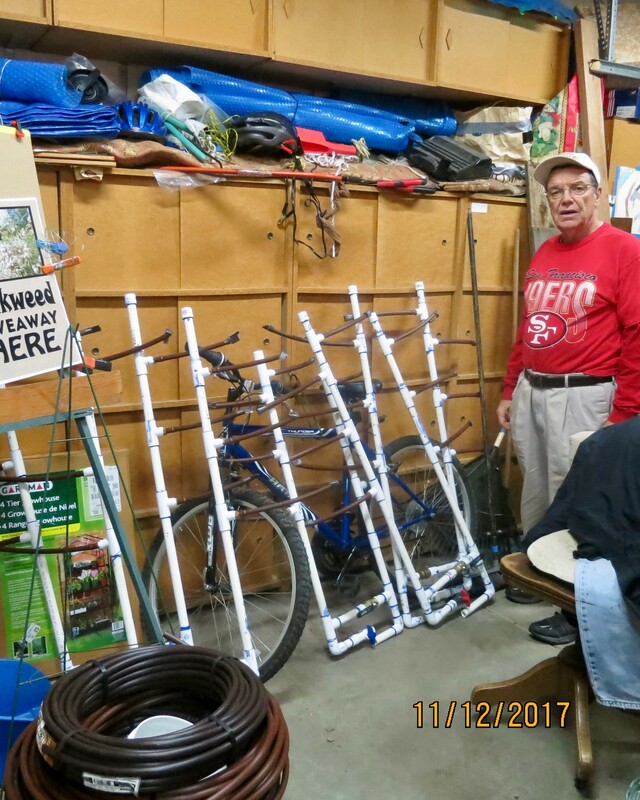 Thanks to Project Coordinator, Patrick Pizzo, for putting all these pipes together in his garage at home and those volunteers who spent about five hours getting the job done. A BIG thank you to Mark for helping us. Great work, guys! 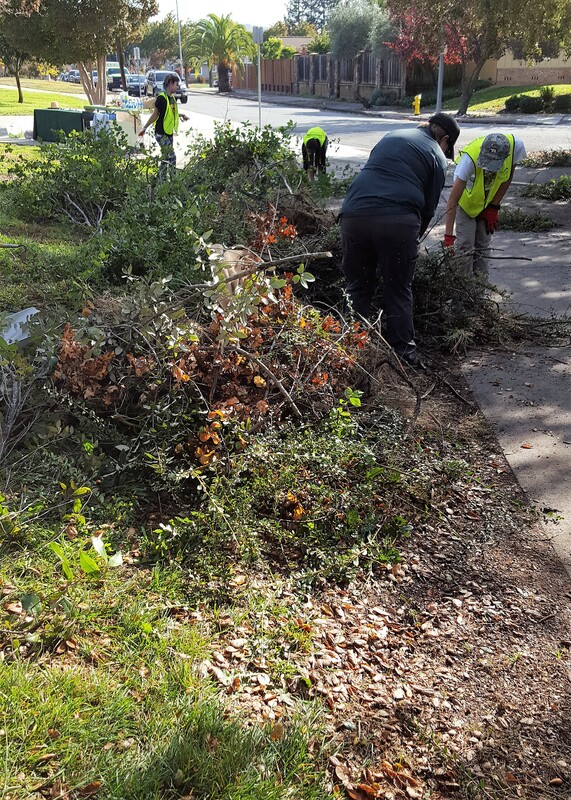 Clean Up in Jeffrey Fontana Park a Success! made one HUGE of debris. Take a look and see if you don’t agree that the Cotoneaster patch is looking Sharp (no pun intended)! Thanks to Pat Pizzo, the Project Director shown on the left.